For many people their cars and trucks are their primary mode of transportation. If the vehicle is denied crucial maintenance services it will soon end up on the back of a tow truck headed to an auto repair shop for expensive repairs. There are many services that vehicles require in order to continue to run properly and it is up to the owner to make sure they get done. Modern vehicles are complex machines with many systems, each having special needs. You can learn about your vehicle's maintenance schedule in your owner's manual or by speaking with a local auto mechanic; just don't forget to have these necessary services completed, or else you'll run into the following issues. Regular maintenance includes services such as power steering fluid flushes and routine brake checks and repair. If you skip out on scheduled maintenance you will find your vehicle becoming more and more difficult to control and stop. This makes your car quite unsafe for yourself and other people on the road. If you deny your vehicle the services it needs you'll soon find yourself filling up more often than you use to. This is because cars require clean air and fuel filters, spark plugs and other parts to be replaced on a regular basis to ensure the vehicle runs correctly and does not struggle for power. Another important facet of auto maintenance is conducting a transmission fluid flush. This service cleans out the transmission of contaminants and broken down fluid, and the transmission fluid filter will be replaced at the same time. This will keep your car from experiencing difficulty shifting, popping out of gear, grinding gears and other transmission related problems. The most important and common form of auto maintenance is the oil change. 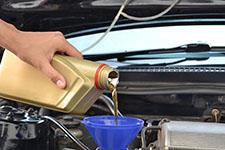 Oil changes should be completed every 3,000 miles or as recommended by your manufacturer to ensure that your vehicle's motor does not suffer from poor lubrication. Old oil breaks down and fails to protect the engine's moving parts as well as fresh oil does. Neglecting your vehicle of regular oil changes will lead to major engine damage. Never skip out on oil changes or other scheduled maintenance as it will only cause you expensive problems down the road. For fast and professional auto maintenance in Covina for your import or domestic car, truck or SUV head to Hye Tech Auto. We take great pride in being able to provide dealership style auto maintenance for any make and model. We look forward to servicing your car! Give us a call at (626) 332-5452 to schedule expert auto maintenance in Covina or the surrounding area.